The United States Air Force is the most recent branch of the U.S. military formed on September 18, 1947. Before that, the Air Force was part of the Army known as the U.S. Army Air Corps and the U.S. Army Air Service. The mission of the Air Force is to fly, fight and win in air, space and cyberspace. 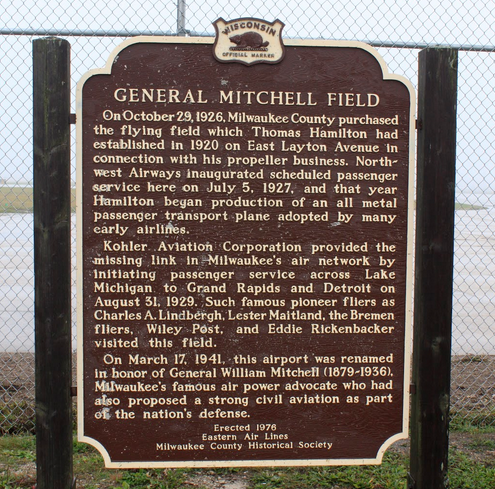 General William "Billy" Mitchell, often regarded as the father of the modern Air Force, was raised in Milwaukee and is the namesake of the city's airport, General Mitchell International Airport. The official website of the U.S. Air Force and its history. This media files is in the public domain. 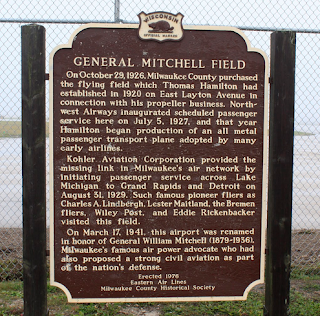 a nearby State Historical Society "official" marker honoring General Mitchell. The U.S. Air Force Tribute is second from the right. the Milwaukee County War Memorial Center.